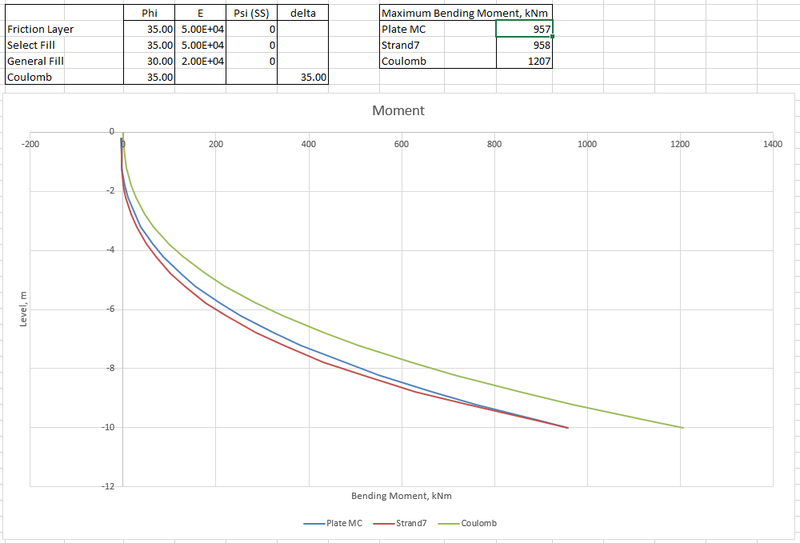 I have used the PlateMC spreadsheet described in the previous post to compare the results of a finite element analysis of a retaining wall with a similar analysis using the commercial package Strand7, and a simple hand calculation using Coulomb soil pressure theory. The retaining wall was a 10 metre high reinforced concrete structure, with an 8 metre wide base. Different soil properties were assigned to the foundations, the fill elements immediately behind the wall, the remaining elements over the wall heel, and the remaining fill. The fill was placed in 2 metre high layers, with a 20 kPa compaction load applied and then removed from each layer. The final load case included a 30 kPa surcharge load, over the full width of the fill top surface. The spreadsheet and Strand7 analyses used the same soil properties, except that the first spreadsheet run included a dilatency angle for the fill elements. For this structure the wall back face angle to the vertical (omega), and the top fill surface angle to the horizontal (beta) were both zero. 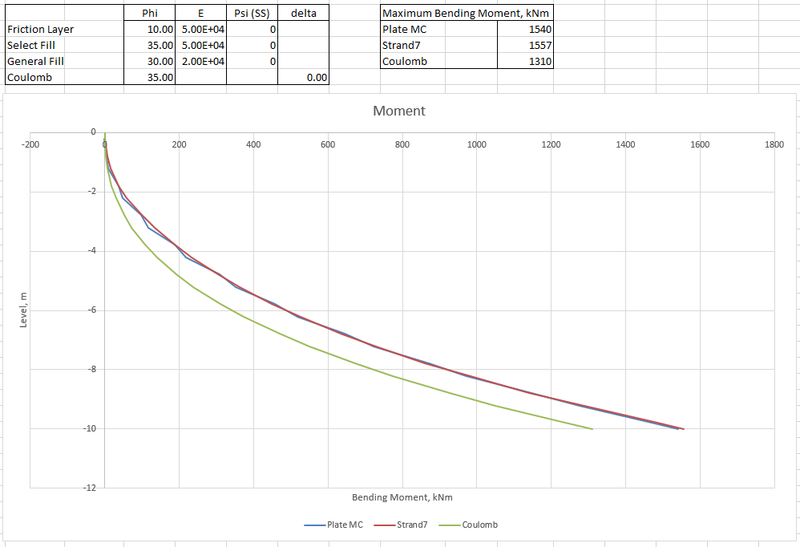 The fill friction angle (phi) and the soil/wall interface friction (delta) are listed in the screen shots below, together with the fill elastic modulus values used in the finite element analyses. 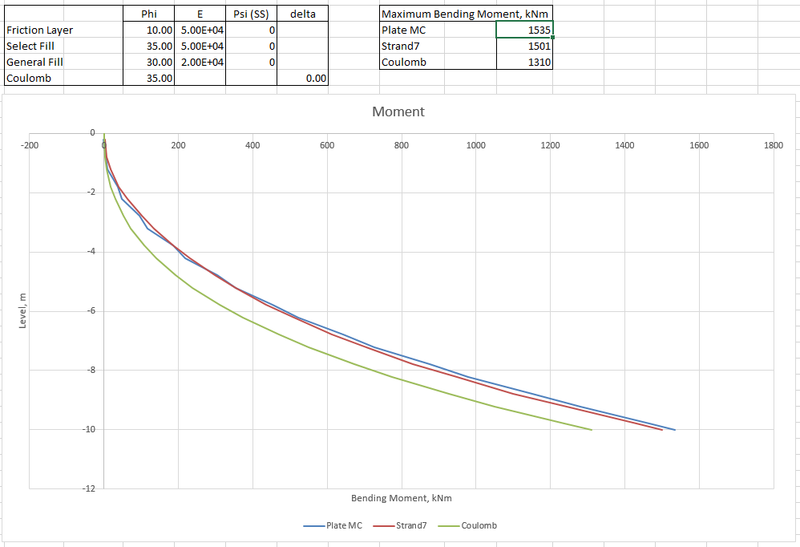 The Plate MC and Strand7 results were similar over most of the wall, but the Strand7 results increased more quickly towards the base, with the moment at the base being about 8% higher. 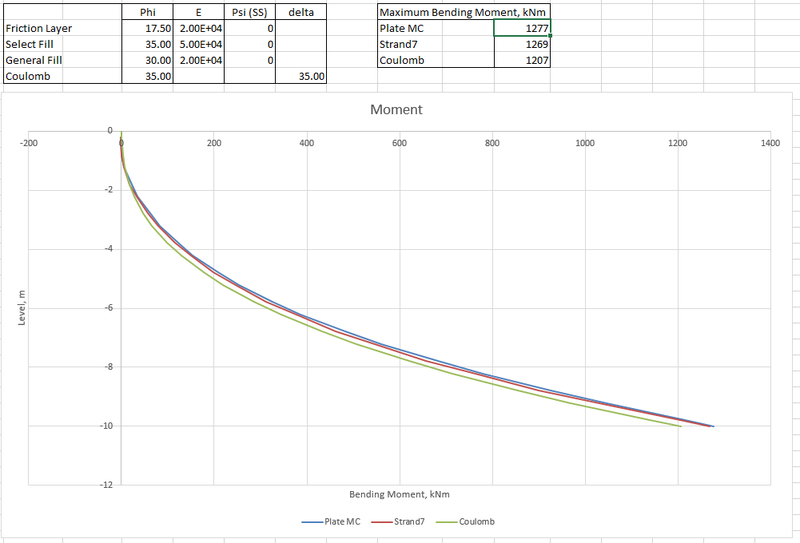 The hand calculation was about 20% higher than the Strand7 results. 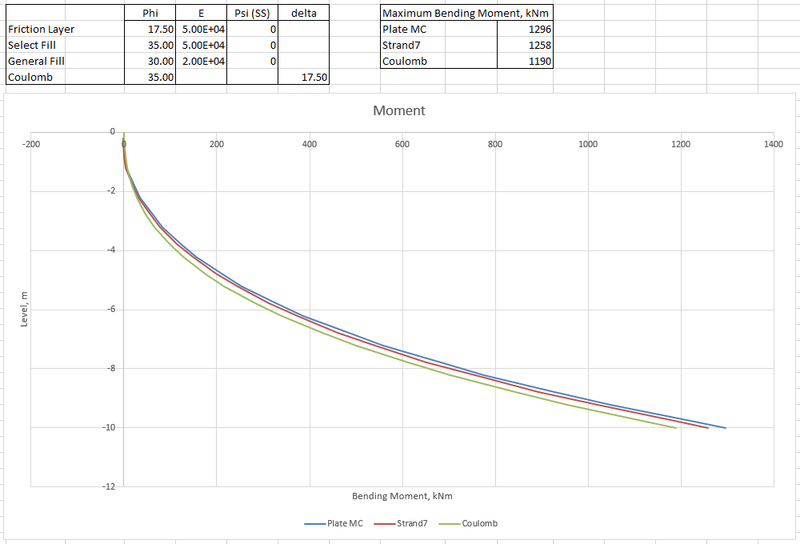 Bending moments at the base were slightly increased, but the results are still about 6% lower than the Strand7 results. 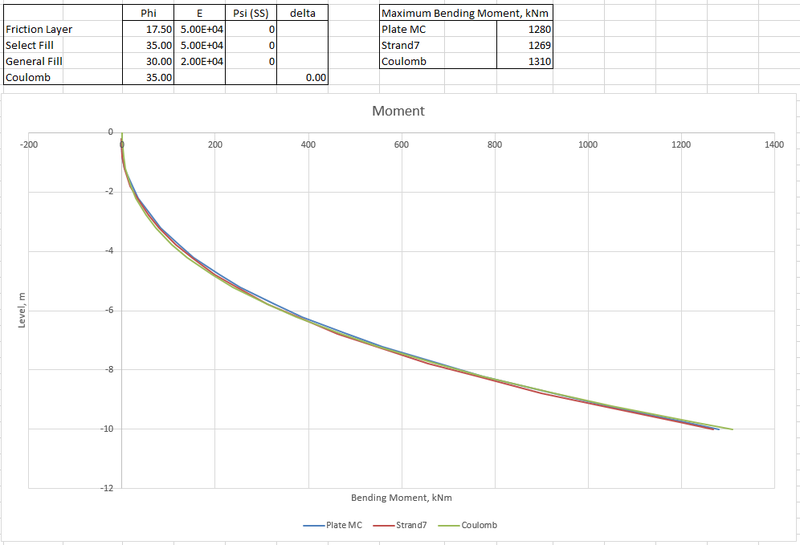 Reducing the friction angle of the friction layer (and the hand calculation delta angle) to 17.5 degrees increased both finite element analyses by about 20%, with the PlateMC results now being a little higher. 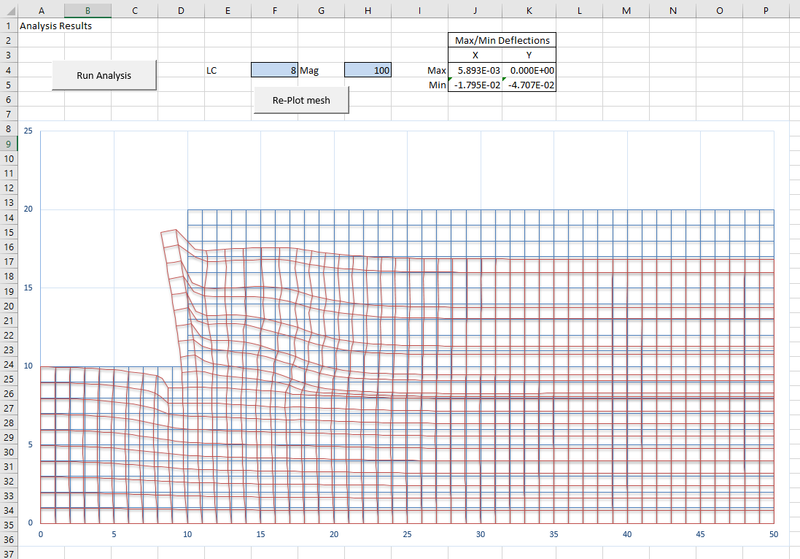 The hand calculation moment was reduced a little (about 1%), reducing it to less than the FEA results. 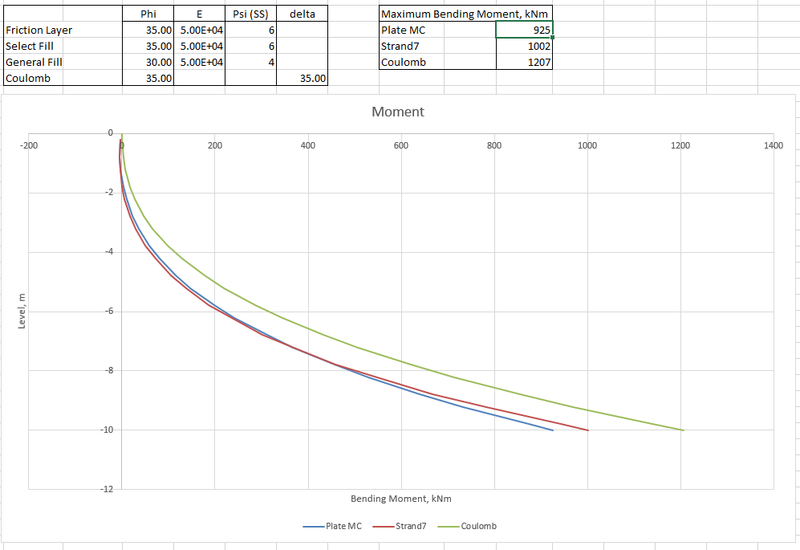 Results from the spreadsheet, PlateMC_staged, and Strand7 were reasonably consistent, especially with reduced friction angles for the friction layer. Maximum bending moments from the hand calculation were significantly higher than the finite element results when the full friction angle was used. Reducing the friction layer friction had much less effect on the hand calculation results than the FEA results. Reasonably consistent results were found (in this case) when the FEA results with friction zone angle of 17.5 degrees were compared with the hand calculation results with zero interface friction. 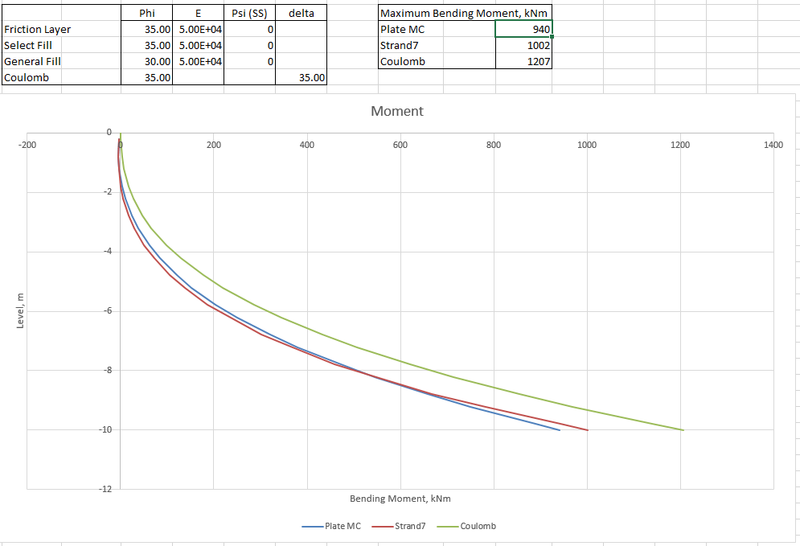 This entry was posted in Excel, Finite Element Analysis, Fortran, Frame Analysis, Geotechnical Engineering, Link to dll, Link to Python, Newton, NumPy and SciPy, Strand7, UDFs, VBA and tagged Coulomb, ctypes, Excel, FEA, Fortran, Ka, link to dll, plane strain, Programming the Finite Element Method, Python, soil-structure interaction, staged analysis, VBA, xlwings. Bookmark the permalink.